Over the years, Ethernet technologies have evolved rapidly and amazingly to meet the never-ceasing requirements of higher bandwidth and faster data transmission speeds for high quality network applications, such as live video and video download with high resolution. Through this great evolution, Ethernet technology standards have been designed, like 10 Gigabit Ethernet (GbE). After IEEE Standard 802.3ae- 2002 for 10GbE was ratified several years ago, some enterprises have begun to deploy 10GbE in their data centers to support bandwidth-needing applications. Before deploying 10GbE, as matter of fact, there are many things that should attract your attention. Here this article lists two important things you need to consider for a reliable 10GbE deployment: 10GbE cabling choices, and 10GbE transceiver types. Along with the technological revolution, cables used for transmission also experienced progressive development. There are two physical media available for 10GbE transmission: fiber and copper. Fiber cables fall on two classifications: single-mode fiber (SMF) and multi-mode fiber (MMF). In SMF, there is only one path for light, while in MMF light flow through multiple paths. SMF is intended for long distance communication and MMF is used for distances of less than 300 m. Commonly used 10GbE ports designed for SMF are 10GBASE-LR, 10GBASE-ER and 10GBASE-ZR, and the ports specified for MMF are 10GBASE-SR and 10GBASE-LRM. It’s of great importance to choose these ports 10GbE transmission when link lengths matter. For example, you can choose a J9150A transceiver when the required distance is less than 300m. In a word, the form factor options depend on your link lengths. As the structured cabling techniques become mature, copper cabling technology also grasps the chance to develop itself. And more and more people start to choose copper cables as the medium for 10GbE transmission. 10GBASE-T and SFP+ direct attach cables (DAC) standards symbolize copper applications. 10GBASE-T, or IEEE 802.3an-2006, is a standard released in 2006 to provide 10Gbit/s connections over unshielded or shielded twisted pair cables, over distances up to 100 metres (330 ft). It requires the Cat 7 or Cat 6A to reach 100 meters, but can still work on Cat 6, Cat 5E, or even Cat 5 cable when reduced distances are required. SFP+ DAC is the latest standard for optical transceivers, and it connects directly into an SFP+ housing. In SFP+ DAC cabling assembly, no optical transceiver is used at each end. A cable was invented with each end physically resembling a SFP+ transceiver, but with none of the expensive electronic components. This creation is known as DAC. Actually, besides 10GbE applications, DAC is also considered as a cost-effective solution to replace fiber patch cables sometimes in 40GbE systems. 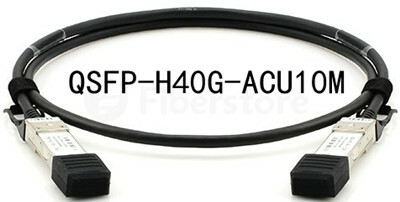 Like QSFP-H40G-ACU10M, this Cisco 40G cabling product is the QSFP to QSFP direct attach passive copper cable assembly designed for 40G links. After choosing cables, you need to select devices that connect these cables to your networks. These devices are transceivers. 10GbE has four transceiver types: XENPAK (and related X2 and XPAK), GBIC, SFP and SFP+. XENPAK is a Multisource Agreement (MSA) that defines a fiber-optic or wired transceiver module which conforms to the 10 Gigabit Ethernet (10GbE) standard of the Institute of Electrical and Electronics Engineers (IEEE) 802.3 working group. X2 defines a smaller form-factor 10 Gb/s pluggable fiber optic transceiver optimized for 802.3ae Ethernet,ANSI/ITUT OC192/STM- 64 SONET/SDH interfaces,ITUT G.709,OIF OC192 VSR,INCITS/ANSI 10GFC (10 Gigabit Fibre Channel) and other 10 Gigabit applications.X2 is initially centered on optical links to 10 kilometers and is ideally suited for Ethernet,Fibre Channel and telecom switches and standard PCI (peripheral component interconnect) based server and storage connections. X2 is physically smaller than XENPAK but maintains the mature electrical I/O specification based on the XENPAK MSA and continues to provide robust thermal performance and electromagnetic shielding. The 10GB X2 fiber optic transceivers series include X2-10GB-SR, X2-10GB-LR, X2-10GB-ER and X2-10GB-ZR, they are designed based on the X2 MSA and IEEE802.3ae. They’re created for the integrated systems solution provide, fiber optics distributor along with other IT distributors. SFP+, also called SFP Plus, is short for enhanced small form-factor pluggable, an enhanced version of the SFP that supports data rates up to 16Gbit/s. SFP+ 10GbE transceiver series include SFP+ 10GBASE-SR, SFP+ 10GBASE-LR, SFP+ 10GBASE-ER, and so on. Among these types, 10GBASE-SR is widely used when the required distance is less than 500m. Say SFP-10G-SR, this Cisco 10GBASE-SR SFP+ transceiver listed in Fiberstore is designed to support 10GbE applications with the maximum distance reach of 300m. After discussion, maybe you have obtained a better understanding of 10GbE cables and transceivers, which helps you to better choose the right devices for your 10GbE applications. Fiberstore supplies various numbers of 10GbE cables and transceivers which are quality assured. For more information about 10GbE solutions, you can visit Fiberstore directly.